Holds, training equipment, tools, gear, if it’s related to indoor setting, send it to us. We’re one of the largest indoor bouldering gyms in the World, and our setting team has over 80 years of combined gym and comp experience. We’re always excited to see the new ideas for gear, training, and holds, and at our gym your gear will truly be put through the wringer. Wanna know how tough it really is? Give it The Spot Test. With our challenging walls of all angles and high traffic from everyone from kids to world-class climbers, The Spot is the ideal place to test your holds. Send us the best of the best and we’ll check ’em out, try ’em out, and report back. Click the logos or links to see the reviews we’ve done so far. Newest are first. We had a big dyno comp at the CWA After Party this year and used holds from many of the exhibiting companies. The comp went off well and we did mini-reviews of the holds we got as well. The review includes holds from So Ill, Kingdom, Element, Rock Candy, Enterprises, Volx, Holdtopia, and E-Grips. Aesthetics are important – we are drawn to holds in single colors with clean lines. Climbers are drawn to them as well. Comfort is important. There is no room for tweaky holds in our gym. We want people to get stronger and have fun, not get hurt. We do not use many screw-ons and try to avoid martini bolts, so unless they are really really special it’s probably better to send us washered holds to test. Our walls are far from flat, so urethane is a must. We’ll break most resin holds the first time we try and tighten them onto the wall. Really. If you want to say your holds are unbreakable, we will find out. If they pass The Spot Test they’ll stand up anywhere. We love anything uncomplicated and special. Big holds, smooth lines, nice comfortable hand positions. These things make us, and our customers, the happiest, and they are what we look for when ordering new holds. We love tanks and t-shirts! Jackie is nearly 5’10” tall though so she usually wears a men’s medium, as do Connor and Ian. Jake is a medium or a large, Kevin is a large, and Lily usually goes with women’s medium. Questions? Comments? Ideas? 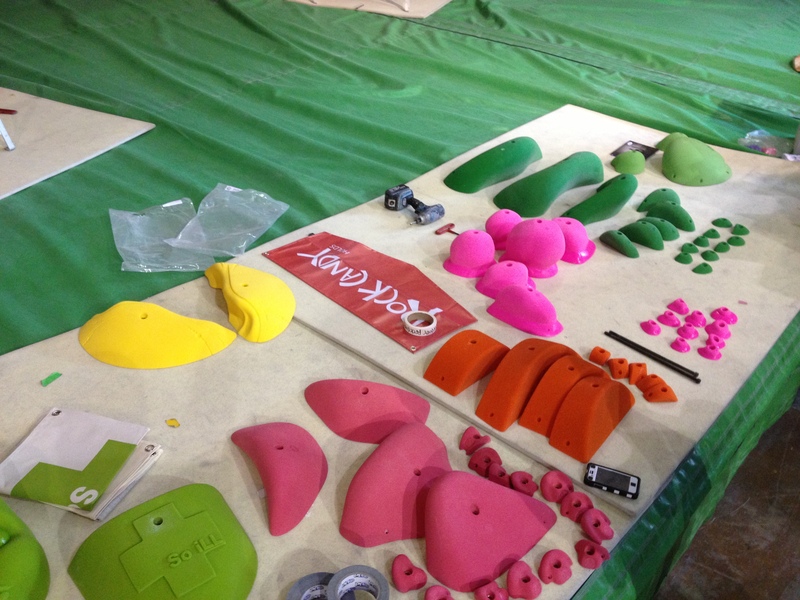 Want us to test your indoor climbing holds or gear?